1 How lovely are Thy dwellings, Jehovah of Hosts! 2 My soul longs, yea, even languishes, for the courts of Jehovah, My heart and my flesh cry out for the living God. 3 Yea, the sparrow has found a house, And the swallow a nest for herself, where she lays her young, Thine altars, Jehovah of Hosts. My King and my God. 4 Blessed they that dwell in Thy house! They will be still praising Thee, Selah. 5 Blessed the man whose strength is in Thee, In whose heart are the ways! 6 [Who] passing through the valley of weeping make it a place of fountains, Yea, the early rain covers it with blessings. 7 They go from strength to strength, Each appears before God in Zion. 8 Jehovah, God of Hosts, hear my prayer, Give ear, O God of Jacob. Selah. 9 [Thou], our shield, behold, O God, And look upon the face of Thine anointed. 10 For better is a day in Thy courts than a thousand, Rather would I lie on the threshold in the house of my God, Than dwell in the tents of wickedness. 11 For Jehovah God is sun and shield, Grace and glory Jehovah gives, No good does He deny to them that walk in integrity. 12 Jehovah of hosts, Blessed the man that trusts in Thee! The same longing for and delight in the sanctuary which found pathetic expression in Psalms xlii., xliii., inspire this psalm. Like these, it is ascribed in the superscription to the Korachites, whose office of door-keepers in the Temple seems alluded to in ver. 10. To infer, however, identity of authorship from similarity of tone is hazardous. The differences are as obvious as the resemblances. As Cheyne well says, "the notes of the singer of Psalms xlii., xliii., are here transposed into a different key. It is still 'Te saluto, te suspiro,' but no longer 'De longinquo te saluto' (to quote Hildebert)." The longings after God and the sanctuary, in the first part of the psalm, do not necessarily imply exile from the latter, for they may be felt when we are nearest to Him, and are, in fact, an element in that nearness. It is profitless to inquire what were the singer's circumstances. He expresses the perennial emotions of devout souls, and his words are as enduring and as universal as the aspirations which they so perfectly express. No doubt the psalm identifies enjoyment of God's presence with the worship of the visible sanctuary more closely than we have to do, but the true object of its longing is God, and so long as spirit is tied to body the most spiritual worship will be tied to form. The psalm may serve as a warning against premature attempts to dispense with outward aids to inward communion. It is divided into three parts by the Selahs. The last verse of the first part prepares the way for the first of the second, by sounding the note of "Blessed they," etc., which is prolonged in ver. 5, The last verse of the second part (ver. 8) similarly prepares for the first of the third (ver. 9) by beginning the prayer which is prolonged there. In each part there is a verse pronouncing blessing on Jehovah's worshippers, and the variation in the designations of these gives the key to the progress of thought in the psalm. First comes the blessing on those who dwell in God's house (ver. 4), and that abiding is the theme of the first part. The description of those who are thus blessed is changed, in the second strophe, to "those in whose heart are the [pilgrim] ways," and the joys of the progress of the soul towards God are the theme of that strophe. Finally, for dwelling in and journeying towards the sanctuary is substituted the plain designation of "the man that trusts in Thee," which trust is the impulse to following after God and the condition of dwelling with Him; and its joys are the theme of the third part. The man who thus interpreted his own psalm had no unworthy conception of the relation between outward nearness to the sanctuary, and inward communion with the God who dwelt there. The psalmist's yearning for the Temple was occasioned by his longing for God. It was God's presence there which gave it all its beauty. Because they were "Thy tabernacles," he felt them to be lovely and lovable, for the word implies both. The abrupt exclamation beginning the psalm is the breaking into speech of thought which had long increased itself in silence. The intensity of his desires is expressed very strikingly by two words, of which the former (longs) literally means grows pale, and the latter fails, or is consumed. His whole being, body and spirit, is one cry for the living God. The word rendered "cry out" is usually employed for the shrill cry of joy, and that meaning is by many retained here. But the cognate noun is not infrequently employed for any loud or high-pitched call, especially for fervent prayer (Psalm lxxxviii. 2), and it is better to suppose that this clause expresses emotion substantially parallel to that of the former one, than that it makes a contrast to it. "The living God" is an expression only found in Psalm xlii., and is one of the points of resemblance between it and this psalm. That Name is more than a contrast with the gods of the heathen. It lays bare the reason for the psalmist's longings. By communion with Him who possesses life in its fulness, and is its fountain for all that live, he will draw supplies of that "life whereof our veins are scant." Nothing short of a real, living Person can slake the immortal thirst of the soul, made after God's own life, and restless till it rests in Him. The surface current of this singer's desires ran towards the sanctuary; the depth of them set towards God; and, for the stage of revelation at which he stood, the deeper was best satisfied through the satisfaction of the more superficial. The one is modified by the progress of Christian enlightenment, but the other remains eternally the same. Alas that the longings of Christian souls for fellowship with God should be so tepid, as compared with the sacred passion of desire which has found imperishable utterance in these glowing and most sincere words! Ver. 3 has been felt to present grammatical difficulties, which need not detain us here. The easiest explanation is that the happy, winged creatures who have found resting-places are contrasted by the psalmist with himself, seeking, homeless amid creation, for his haven of repose. We have to complete the somewhat fragmentary words with some supplement before "Thine altars," such as "So would I find," or the like. To suppose that he represents the swallows as actually nesting on the altar is impossible, and, if the latter clauses are taken to describe the places where the birds housed and bred, there is nothing to suggest the purpose for which the reference to them is introduced. If, on the other hand, the poet looks with a poet's eye on these lower creatures at rest in secure shelters, and longs to be like them, in his repose in the home which his deeper wants make necessary for him, a noble thought is expressed with adequate poetic beauty. "Foxes have holes, and birds of the air roosting-places, but the Son of Man hath not where to lay His head." All creatures find environment suited to their need, and are at rest in it, man walks like a stranger on earth, and restlessly seeks for rest. Where but in God is it to be found? Who that seeks it in Him shall fail to find it? What their nests are to the swallows, God is to man. The solemnity of the direct address to God at the close of ver. 3 would be out of place if the altar were the dwelling of the birds, but is entirely natural if the psalmist is thinking of the Temple as the home of his spirit. By the accumulation of sacred and dear names, and by the lovingly reiterated "my," which claims personal relation to God, he deepens his conviction of the blessedness which would be his, were he in that abode of his heart, and lingeringly tells his riches, as a miser might delight to count his gold, piece by piece. The first part closes with an exclamation which gathers into one all-expressive word the joy of communion with God. They who have it are "blessed," with something more sacred and lasting than happiness, with something deeper and more tranquil than joy, even with a calm delight, not altogether unlike the still, yet not stagnant, rest of supreme felicity which fills the life of the living and ever-blessed God. That thought is prolonged by the music. The second strophe (vv. 5-8) is knit to the first, chain-wise, by taking up again the closing strain, "Blessed the man!" But it turns the blessedness in another direction. Not only are they blessed who have found their rest in God, but so also are they who are seeking it. The goal is sweet, but scarcely less sweet are the steps towards it. The fruition of God has delights beyond all that earth can give, but the desire after Him, too, has delights of its own. The experiences of the soul seeking God in His sanctuary are here cast into the image of pilgrim bands going up to the Temple. There may be local allusions in the details. The "ways" in ver. 5 are the pilgrims' paths to the sanctuary. Hupfeld calls the reading "ways" senseless, and would substitute "trust"; but such a change is unnecessary, and tasteless. The condensed expression is not too condensed to be intelligible, and beautifully describes the true pilgrim spirit. They who are touched with that desire which impels men to "seek a better country, that is an heavenly," and to take flight from Time's vanities to the bosom of God, have ever "the ways" in their hearts. They count the moments lost during which they linger, or are anywhere but on the road. Amid calls of lower duties and distractions of many sorts, their desires turn to the path to God. Like some nomads brought into city life, they are always longing to escape. The caged eagle sits on the highest point of his prison, and looks with filmed eye to the free heavens. Hearts that long for God have an irrepressible instinct stinging them to ever-new attainments. The consciousness of "not having already attained" is no pain, when the hope of attaining is strong. Rather, the very blessedness of life lies in the sense of present imperfection, the effort for completeness, and the assurance of reaching it. Ver. 6 is highly imaginative and profoundly true. If a man has "the ways" in his heart, he will pass through "the valley of weeping," and turn it into a "place of fountains." His very tears will fill the wells. Sorrow borne as a help to pilgrimage changes into joy and refreshment. The remembrance of past grief nourishes the soul which is aspiring to God. God puts our tears into His bottle; we lose the benefit of them, and fail to discern their true intent, unless we gather them into a well, which may refresh us in many a weary hour thereafter. If we do, there will be another source of fertility, plentifully poured out upon our life's path. "The early rain covers it with blessings." Heaven-descended gifts will not be wanting, nor the smiling harvests which they quicken and mature. God meets the pilgrims' love and faith with gently falling influences, which bring forth rich fruit. Trials borne aright bring down fresh bestowments of power for fruitful service. Thus possessed of a charm which transforms grief, and recipients of strength from on high, the pilgrims are not tired by travel, as others are, but grow stronger day by day, and their progressive increase in vigour is a pledge that they will joyously reach their journey's end, and stand in the courts of the Lord's house. The seekers after God are superior to the law of decay. It may affect their physical powers, but they are borne up by an unfulfilled and certain hope, and reinvigorated by continual supplies from above; and therefore, though in their bodily frame they, like other men, faint and grow weary, they shall not utterly fail, but, waiting on Jehovah, "will renew their strength." The fabled fountain of perpetual youth rises at the foot of God's throne, and its waters flow to meet those who journey thither. Such are the elements of the blessedness of those who seek God's presence; and with that great promise of certain finding of the good and the God whom they seek, the description and the strophe properly ends. But just as the first part prepared the way for the second, so the second does for the third, by breaking forth into prayer. No wonder that the thoughts which he has been dwelling on should move the singer to supplication that these blessednesses may be his. According to some, ver. 8 is the prayer of the pilgrim on arriving in the Temple, but it is best taken as the psalmist's own. The final part begins with invocation. In ver. 9 "our shield" is in apposition to "God," not the object to "behold." It anticipates the designation of God in ver. 11. But why should the prayer for "Thine anointed" break in upon the current of thought? Are we to say that the psalmist "completes his work by some rhythmical but ill-connected verses" (Cheyne)? 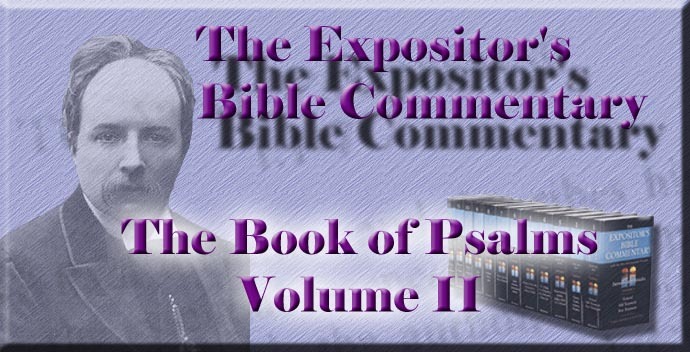 There is a satisfactory explanation of the apparently irrelevant petition, if we accept the view that the psalm, like its kindred Psalms xlii., xliii., was the work of a companion of David's in his flight. If so, the king's restoration would be the condition of satisfying the psalmist's longing for the sanctuary. Any other hypothesis as to his date and circumstances fails to supply a connecting link between the main subject of the psalm and this petition. The "For" at the beginning of ver. 10 favours such a view, since it gives the delights of the house of the Lord, and the psalmist's longing to share in them, as the reasons for his prayer that Jehovah would look upon the face of His anointed. In that verse he glides back to the proper theme of the psalm. Life is to be estimated, not according to its length, but according to the richness of its contents. Time is elastic. One crowded moment is better than a millennium of languid years. And nothing fills life so full or stretches the hours to hold so much of real living, as communion with God, which works, on those who have plunged into its depths, some assimilation to the timeless life of Him with whom "one day is as a thousand years." There may be a reference to the Korachites' function of door-keepers, in that touchingly beautiful choice of the psalmist's, rather to lie on the threshold of the Temple than to dwell in the tents of wickedness. Whether there is or not, the sentiment breathes sweet humility, and deliberate choice. Just as the poet has declared that the briefest moment of communion is in his sight to be preferred to years of earthly delight, so he counts the humblest office in the sanctuary, and the lowest place there, if only it is within the doorway, as better than aught besides. The least degree of fellowship with God has delights superior to the greatest measure of worldly joys. And this man, knowing that, chose accordingly. How many of us know it, and yet cannot say with him, "Rather would I lie on the door-sill of the Temple than sit in the chief places of the world's feasts!" Such a choice is the only rational one. It is the choice of supreme good, correspondent to man's deepest needs, and lasting as his being. Therefore the psalmist vindicates his preference, and encourages himself in it, by the thoughts in ver. 11, which he introduces with "For." Because God is what He is, and gives what He gives, it is the highest wisdom to take Him for our true good, and never to let Him go. He is "sun and shield." This is the only place in which He is directly called a sun, though the idea conveyed is common. He is "the master light of all our seeing," the fountain of warmth, illumination, and life. His beams are too bright for human eyes to gaze on, but their effluence is the joy of creation. They who look to Him "shall not walk in darkness, but shall have the light of life." What folly to choose darkness rather than light, and, when that Sun is high in the heavens, ready to flood our hearts with its beams, to prefer to house ourselves in gloomy caverns of our own sad thoughts and evil doings! Another reason for the psalmist's choice is that God is a shield. (Compare ver. 9.) Who that knows the dangers and foes that cluster thick round every life can wisely refuse to shelter behind that ample and impenetrable buckler? It is madness to stand in the open field, with arrows whizzing invisible all round, when one step, one heartfelt desire, would place that sure defence between us and every peril. God being such, "grace and glory" will flow from Him to those who seek Him. These two are given simultaneously, not, as sometimes supposed, in succession, as though grace were the sum of gifts for earth, and glory the all-comprehending expression for the higher bestowments of heaven. The psalmist thinks that both are possessed here. Grace is the sum of God's gifts, coming from His loving regard to His sinful and inferior creatures. Glory is the reflection of His own lustrous perfection, which irradiates lives that are turned to Him, and makes them shine, as a poor piece of broken pottery will, when the sunlight falls on it. Since God is the sum of all good, to possess Him is to possess it all. The one gift unfolds into all things lovely and needful. It is the raw material, as it were, out of which can be shaped, according to transient and multiform needs, everything that can be desired or can bless a soul. But high as is the psalmist's flight of mystic devotion, he does not soar so far as to lose sight of plain morality, as mystics have often been apt to do. It is the man who walks in his integrity who may hope to receive these blessings. "Without holiness no man shall see the Lord"; and neither access to His house nor the blessings flowing from His presence can belong to him who is faithless to his own convictions of duty. The pilgrim paths are paths of righteousness. The psalmist's last word translates his metaphors of dwelling in and travelling towards the house of Jehovah into their simple meaning, "Blessed is the man that trusteth in Thee." That trust both seeks and finds God. There has never been but one way to His presence, and that is the way of trust. "I am the way. . .. No man cometh to the Father but by Me." So coming, we shall find, and then shall seek more eagerly and find more fully, and thus shall possess at once the joys of fruition and of desires always satisfied, never satiated, but continually renewed.